Six months after the incidents involving the lethal videotape, new clues prove that there is a new evil lurking in the darkness. 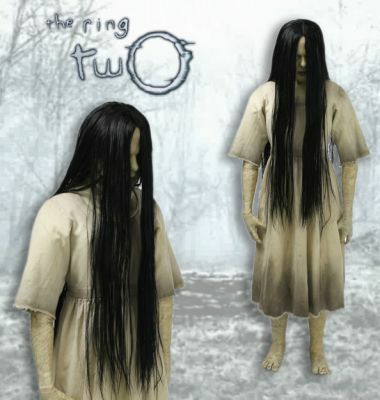 This is a dress and underdress worn by Kelly Stables as "Samara" in "The Ring Two" along with Samara’s (Daveigh Chase) mask, legs and arms from Gore Verbinski’s 2002 horror mystery “The Ring” to complete the display. These pieces were made for use when portraying Samara’s ghoulish appearance; The mask is made from silicone with an inner spandex lining and shows a pale green and dark vein paint effect throughout and features numerous snaps along the bottom where it was anchored into the costume dress. The arm and leg pieces are made of foam latex and serve as full length skin pieces with a similar rotting flesh paint effect. The Dress has documents stating it’s usage in the filming and promotion from DreamWorks, while the mask, arms, and legs have documentation from Rick Baker’s Studio.